This week’s episode of Doctor Who, Dinosaurs on a Spaceship, was a lighter episode which delivered exactly what was promised: dinosaurs on a spaceship. It was not a major episode, but the idea of having dinosaurs on a spaceship sure does appeal to the inner Leonard Hofstadter of every genre fan. There was another bonus: the Doctor got a gang. He actually did the same for A Good Man Goes To War, but at least the Doctor seemed to think he was having fun doing something new. The show was not intended to be a major episode in the (not entirely consistent) continuity of Doctor Who, but it did raise some questions in my mind. What does it mean for a time traveler to have died–or in this case appeared to have died? When Commissioner Gordon wants to summon Batman, there are no timey-whimey matters to be concerned about. Both Commissioner Gordon and Batman are on the same time line and the dates of the attempt to contact Batman and Batman’s calendar totally coincide. When the people of 2367 AD sent a request for help to the Doctor, why did it happen to reach the Doctor at some point following his adventures in Asylum of Daleks as opposed to another time in his life–especially as the Doctor was now thought to be dead? 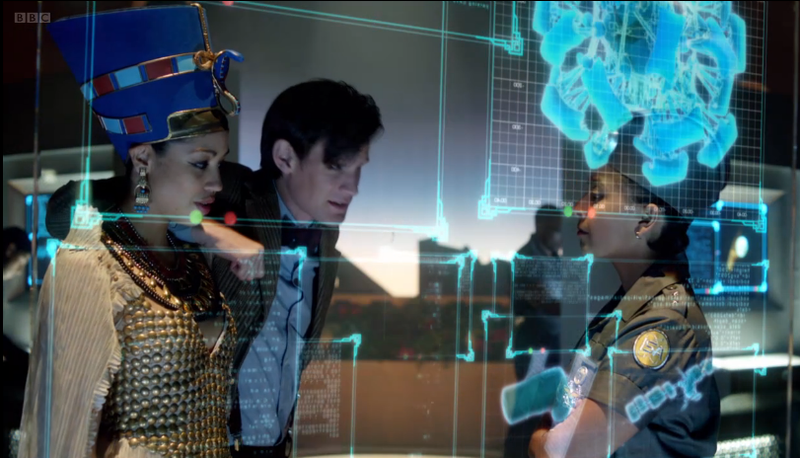 On the other hand, while they apparently knew the Doctor lived, a computer in this episode was unable to find information on the value of the Doctor because of the belief that he was dead. There’s also the question of the Doctor’s changing attitude towards the villains he encounters. The Doctor witched the signals of the Silurian ship and Solomon’s ship, causing the missiles to target and certainly kill Solomon. There have been clear differences between different regenerations of the Doctor in his attitude towards killing, considering previous episodes in which the Doctor tried to save Davros and the Master. I also have my doubts about the possibility of a beach on a spaceship, but who are we to question advanced technology? Perhaps it is nitpicking such as this which is directed towards Steven Moffat on his Twitter account (as opposed to generally supportive blogs) which led Moffat to close his Twitter page. Some of the blog criticism this week went beyond nitpicking of this nature. S.E. Smith objected to how women are handled by Moffat over at Think Progress. I think she is confusing the subservient roles inherent to supportive characters with Moffat’s view of women. I don’t see Amy Pond playing second fiddle to the Doctor as making her weak. We don’t see most of her family because of the nature of her back story. Instead her life beyond the Doctor primarily consists of her relationship with Rory. If you want to see how Moffat is capable of writing strong women, check out Coupling, one of the best sit-coms ever written. (Definitely watch the U.K. version as opposed to the attempt of a US network to handle Moffat’s creation.) The character Steve Taylor was largely based upon Moffat himself. Steve’s girlfriend, Susan Walker, was neither weak nor subservient to Steve. Anyone now want to accuse Moffat of writing weak male characters? “We are going to do the story properly of the Doctor having lost a friend and making a new one. We’re not taking that lightly. It’s not in one door out the other. It’s the story of how all that affects him, why he engages with somebody else and what’s going on with that – that’s all important. “What does Jenna bring to it? It’s surprising just how much the show changes with a new co-star. The Doctor is quite different with her, and the way you watch them is quite different. 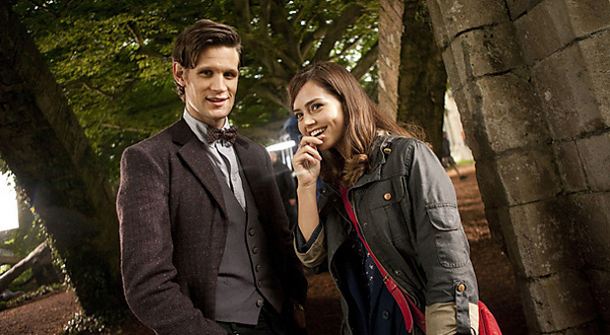 You watched the Eleventh Doctor and Amy arrive together. It’s like they grew up in the same sandpit, playing. They felt not quite like equals – the Doctor never feels like an equal to his companion – but you knew them equally well and they were equally important to each other. They formed around each other. And one of the interesting things about writing the Doctor is that he’s so responsive to the people around him. It’s almost like left on his own his personality would slowly disintegrate. He becomes what people want him to be, a little bit. So he’s Amy’s Raggedy Doctor. We have also learned this week that Coleman is 5’2″ and stands on a phone book when filming close up scenes next to Matt Smith. Recent interviews have also suggested that Jenna-Louise Coleman will play the same Oswin Oswald seen in Asylum of the Daleks, and we will learn in the future how she wound up in that situation. If so, I suspect that the Doctor might come up with a way to get her out of that, as opposed to having already shown us the death of the character. Something close to that was already done with River Song. The title for J.J. Abram’s Star Trek sequel might have leaked out, based upon domain names registered by Paramount. The suspected title is Star Trek Into Darkness. Meanwhile I09 looked back to the original series this week, presenting a list of 10 Things You Probably Didn’t Know About Star Trek: The Original Series. Fox has ordered a science fiction pilot about LAPD officers with android partners. I am far more interested in a show of this description after finding it is coming from J.J. Abrams and J.H. Wyman. The plug-in which allows sharing of blog posts with Facebook and multiple other social networking sites malfunctioned upon updating and I have deactivated it. While there are multiple possible solutions, I don’t have the time today to bother with this. Completing this week’s installment of SciFi Weekend is more important, and then I’ll get back to all the extra work created this week due to going live with an EMR (Electronic Medical Record). Besides, there is always the hope that the authors of the plug-in might provide an upgrade which fixes this if I do nothing. For now there remains an icon to share posts via Twitter. Later in the week, as time allows, I’ll either see about fixing the plug-in for additional sites, reverting to the old version, or replacing the plug-in with an alternative. I appreciate all the shares of posts on sites such as Facebook, but I trust that most users will have no problem pasting in links to share until I get this fixed.